The Nextion LCD touchscreens are great for Arduinos because most of their functionality and processes are self-contained in the screen. 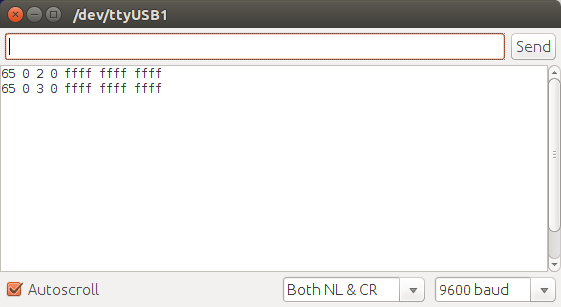 The communication with an Arduino is via a Serial UART port. The benefit is that the Arduino does not use a lot of resources or pins dealing with a high resolution touchscreen, it simply sends serial commands to the screen or receives event notifications such as button presses. This tutorial uses a very simple Nextion library. Note that the 4.3" version consumes up to 250mA, the 2.4" model up to 90mA. Both are well within the specs of the Arduino UNO's 5V regulator (450mA). For this first part of the tutorial we are going to be using a firmware that demonstrates a couple of buttons, a progress bar and a text field. NOTE: The older .tft files are not compatible with the latest firmware. Please load the .HMI source files into the Editor, compile and use the newly generated and upgraded .tft files in the example below. Press the check boxes and note how the boxes give feedback when they are being pressed. They still do not change to Selected because we haven't sent the command to do so yet. The .HMI file is included in the firmware folder. Relevant data to note when looking at the .hmi example file. There are only three full screen graphics loaded and they are referenced as Pictures 0, 1 and 2. See the section "The Graphics and Image Cropping". There is only one page and it is referenced as 0. Its background has been set to Picture 0.
m0 (ID:1) is a touch area. The only parameter changed is in the Touch Press Event -- Send key value is selected. b0 (ID:2) is an image crop button. The default image "picc" is 0. The Pressed image "picc2" is 1. In the Touch Release Event tab the Send key value is selected. b1 (ID:3) is an image crop button. The default image "picc" is 0. The Pressed image "picc2" is 1. In the Touch Release Event tab the Send key value is selected. t0 (ID:4) is a text area with a solid white background, right aligned. The Pressed image configured to 1 is why the check boxes show the round grey circle when they are being pressed even though we haven't configured anything in the Arduino yet. Upload the "ReceiveMessages.ino" sketch from nextion/examples and open the Serial Monitor. Try pressing and releasing the two checkboxes. The responses should appear in the monitor. Note that the messages only appear after releasing the buttons. The exact behaviour is configured in the relevant Touch Event tab in the editor. Using the listen() function any message coming from the Nextion is stored in a String. This can be read as: "Button 1 on Page 0 was released". But it's easy to just copy the message and compare was done in the code above. Now, if everything went well when the first button is pressed and released the green checkbox is turned on! It won't turn off because we haven't told it to. What would be the commands to turn the button Off? "b0.picc=0" and then "ref b0". This switches the image behind the first button back to 0. Toggling buttons on and off are a common occurrence in controls so we decided to add a function called buttonToggle(). Upload the "ToggleButton.ino" example and test the buttons. They should now switch between Checked and Unchecked. Upload the "UpdateText.ino" example to your Arduino. 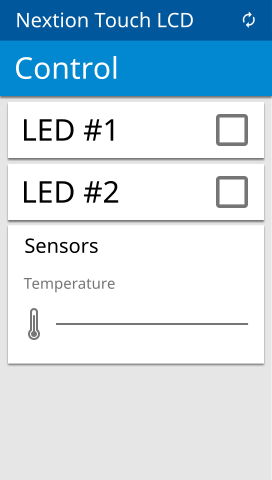 The text field in the Sensors card should be flashing between "Hello" and "1234". In the loop() are two examples of how to send text to a text area. In the Nextion Editor there is a component called a Progress bar. There are several aspects that I don't like about the implementation. First, it requires that one isolates the graphics for an empty and full progress bar and then add them to the Pictures in the Editor. Secondly, every time the progress bar receives a new value it erases the progress bar entirely and then repaints it. This causes a noticeable flicker even if it repaints with the same value. Hopefully, this will be fixed in the future. Using the following technique, creating the graphics is a lot simpler. There is no flicker. And the technique can be used in a variety of creative ways. The three screens below are the ONLY graphical assets that were used in this project. Each screen is only between 17 and 19 kilobytes. Even the temperature progress bar states are included here. The first screen has all the graphics in their default or OFF states. The second displays both the buttons in their Pressed state. And in the third the buttons are shown in their Selected State and the progress bar is completely filled. How can this be? What if I want one button ON and the other OFF? How do I set the progress bar to 50%? The trick is to use a technique called image cropping. Certain components, such as buttons, can allow a specified area of another screen to show through. So, for button 1 to show the green selected icon just allow the image from Picture ID #2 to be displayed only around the area of the button. To make the temperature sensor show 50% red, allow half the progress bar of Picture ID #2 to display. The direct command to display a portion of a picture is "picq" which exposes a section of a picture at coordinates x,y with a certain width and height. This can be done manually using the sendCommand() function or by using the updateProgressBar() function. The value to be displayed should be scaled between 0 and 100. This can be done easily with the map() function. In order to "wipe" the progress bar we will need to its x,y position and it's width and height. A quick and easy method is to use Add Component-->Progress bar to create a temporary component. Move and stretch the component over your progress bar and write down the values x,y,w,h. Then Delete Component-->Delete Selected Component to erase the component. Upload the "UpdateProgressBar.ino" sketch to the Arduino. This sketch monitors analog port 0 and displays the values on the progress bar and the text area. To test I connected a potentiometer to 5V and GND with the wiper connected to pin A0. Upload the "AllTogether.ino" sketch. The buttons should toggle, the progress bar should update and the text field should display the value of A0. These screens were created entirely using Inkscape. The Google Material Design Guidelines were a great help in figuring out how to approach a layout in a simple, elegant fashion. Google provides all the icons, fonts and colour palette in formats that can be used in just about any application.